Fin Cop Hill Fort dates back to the Iron Age and is situated near the Peak District village of Ashford in the Water. 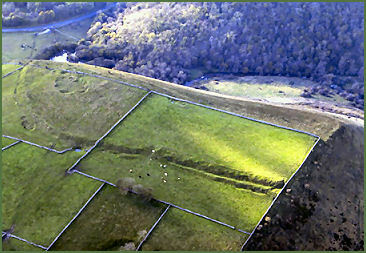 The hillfort is located 313 metres (1025 feet) above sea level on the limestone crest of steep sided Fin Cop which overlooks the valley of Monsal Dale. The fort is one of the larger examples of hilltop enclosures in the Peak District and encloses an area of approximately 4 hectares (10 acres), It is well defended by a double bank and ditches to the south and east, to the north and west the deep gorge of Monsal Dale drops steeply to the river Wye. The fort consists of a single rampart, ditch and bank, at the northern end is a further outer bank and ditch. Construction of the hill fort has been dated to some time between 440BC and 390BC, but it seems to have been mysteriously destroyed before it was completed. Along the western edge of the Fin Cop escarpment, near to the position of the fort, there is evidence of at least five barrows. One of these barrows was excavated in the 1920’s by Major T. Harris, a local antiquarian, who discovered a cist burial, along with the remains of 30 people, a collared urn and a food vessel. Archaeological excavations carried out in 2009 and 2010 and funded by the Heritage Lottery Fund at Fin Cop revealed a gruesome discovery unearthing evidence of a bloody massacre linked to Iron Age warfare. An Iron age mass grave at the site of the fort contained the unceremoniously buried remains of only women and children, nine skeletons of women, one of whom was pregnant, four babies, a toddler of around two years old and a single teenage male who was found in a in a crouched position. The skeletons were discovered in a section of ditch around the fort. Only a small part of the ditch, but ten out of 400 metres of the ditch have been excavated so far and it is thought that many more skeletons could be interred there. The fort's stone wall had been broken up and the rubble used to fill the 400 metre perimeter ditch, where the skeletons were found. Most of the bodies were located between layers of stone which had been thrown into the ditch.Animal bones, also buried in the ditch, suggest the fort's inhabitants kept cattle, sheep and pigs. A further skeleton dating to the same time period, which belonged to a child, was discovered in a cave below the site in 1911 and could be related to the same event. The archaeologists are puzzled by the apparent absence of adult males at Fin Cop. None of the victims displayed fatal trauma on their bones, and it seems most likely that the cause of death was soft-tissue wounds. There were no personal possessions buried with them, suggesting the captors removed any valuables. Seven of the skeletons have been radiocarbon dated to between 410-40 BC. Dr Clive Waddington, who directed the two-year dig for Archaeological Research Services, commented "In recent years there has become an almost accepted assumption that warfare in the British Iron Age is largely invisible. Hill forts have been seen as displays of power, prestige and status rather than places with a serious military purpose. 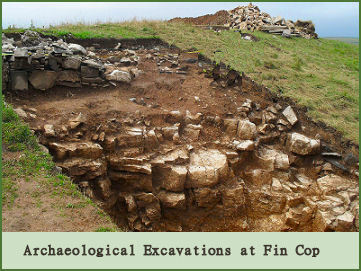 The gruesome discoveries at Fin Cop have reopened the debate on the purpose of hill forts. For the people living here, the hurriedly constructed fort was evidently intended as a defensive work in response to a very real threat. Significantly, Fin Cop was probably not the only settlement to have been destroyed by attackers. For just a few miles way, at Bakewell, another fortified settlement appears to have met a similar fate.